Two posts today as I could no longer bear orange upon my fingernails. I needed the comfort of familiar colours. I needed blue. Nubar Absolute, from the Prisms collection (my reward for resisting the siren temptation of nicotine) soothed my orange-ravaged soul quickly and effectively. The polish was a bit sheer, requiring four coats to get almost opaque, and holo effect was quite subtle, but is still lovely. The nails were Konaded with the flowers found on Konad plate m60. 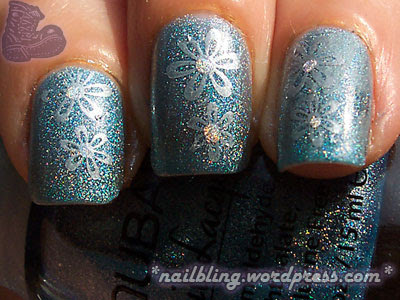 Superdrug MUA Shade 11 was used to stamp the flower images, and a dot of Gosh 549 was applied to the centre of the flowers.